Christmas is coming - along with the common requests for Kris Kringle gifts. This year, I decided that, rather than wasting my energy trying to find something appropriate within the specified price range, I would use it as an opportunity to explore some textile techniques. 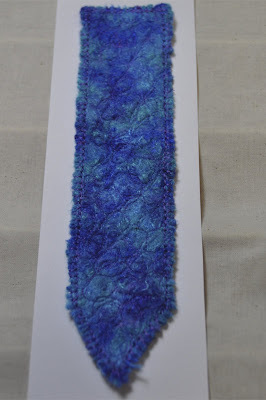 I started this bookmark by knitting three yarns together on very large (15mm) needles. I then needlefelted it all over before machine embroidering over the top. It is finished off with a machined buttonhole stitch around the edges. I hope the recipient likes it but I've had fun playing around - more enjoyable than shopping. Great idea to make your own. An easy and very effective bookmark.